95-97 Glasgow Road, Clydebank, near Glasgow. Connolly’s Bar, Restaurant, Glasgow Road, Clydebank. 1970s. It’s farewell to Connolly’s Bar, the “Star” of a Gracie Fields film! A Clydebank public house which has been at the heart of the town’s eventful history for many years has closed down and the licensee who has been associated with the premises for 40 years is going into retirement. 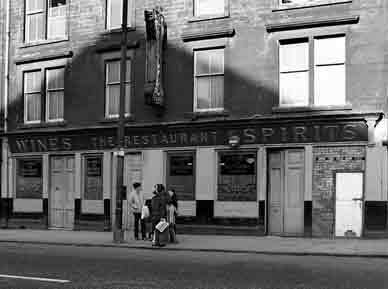 The premises are Connolly’s Bar, 95-97 Glasgow Road, only a stone’s throw from Clydebank’s famous shipbuilding centre. The licensee is Mr. Denis McLaughlin. In such a situation the premises naturally became a favourite place of call for thousands of shipbuilding workers and personalities associated with shipbuilding over the years. It was at John Brown’s shipyard, of course, that the Queen Mary and Queen Elizabeth were built and launched. The yard was also the birthplace of innumerable other vessels, among them the Royal Yacht, the Indefatigable and the Vanguard. Mr. McLaughlin served as manager of the premises for 20 years under the former owner, Mr. Daniel J. Connoly, who had taken over in 1921. After Mr. Connolly’s death the premises went into trust before a company, D. J. Connolly, Ltd, was formed, Mr. McLaughlin becoming the licence- holder. For Denis McLaughlin the end of a famous pub that helped to make history. One featureof the pub’s spacious public bar was a large Johnnie Walker mirror, 8 ft. by 5 ft., believed to date back to before the turn of the century. Connolly’s Bar became known not only to shipbuilding and shipping people, but also to personalities in show business and also to boxers, footballers and golfers. Mr. McLaughlin remembers with pride that a replica of the bar was built on the studio of a Gracie Fields film, “Shipyard Sally” in 1938. The premises became a focal point during a dispute at the Upper Clyde Shipbuilders a few years ago. A Russian TV team came over and used the premises as background for a documentary. It is because of redevelopment that the premises have closed. For the past 23 years Mr. McLaughlin has had as his right-hand man Mr. Philip Allen, and between them they have had 63 years association with the premises. 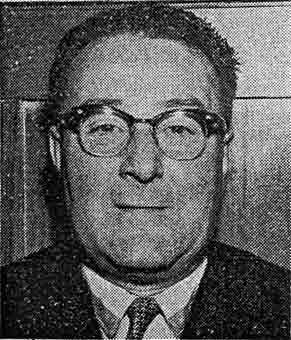 For many years Mr. McLaughlin was active in the affairs of Clydebank L.T.A. which is now part of the Strathclyde Association, and for about 10 years latterly he was the Clydebank vice-president. 1976.